A book with decades of life experience. The author J. Mas, he's inspired on his poetry in the teachings of G.I.Gurdjieff. 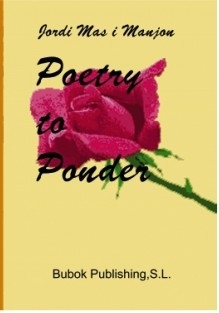 It is a poetry breaker schemes, deconstruction of established forms, a poem to ponder. Do not wait for the reader, an ordinary reading, language is used freely but in a methodical thought, to lead the reader to discover the self. (There is freedom in the use of language rules that are deliberately used in this work written to inspire the reader).Discovery of other dimensions, an encounter with the absolute. The experience exposed a poetic, in behavioral studies and human cognition. Excellent book inspired by the authentic teachings of Gurdijeff. I am very grateful to the author J. Mas. this is a very profound contemporary poetry. Thanks to the author I have come to enjoy the poetry. this author, he reaches the center of the heart. I'd strongly recommend that the author publishes his work in his mother tongue, in my humble opinion I believe it might gain much in terms of making sense. Es un poeta con una especial capacidad expresiva de las emociones y sentimientos a través de su poética, el editor Howard Ely, de la biblioteca internacional de la poesía, dice del autor, "muchos autores escriben durante años y nuncan obtienen el nivel artístico de su trabajo", el autor, J. Mas, expresa profundamente al lector aquello que pertenece a la subjetividad más íntima. Poetry to Ponder es una obra preciosista en todo su contenido, para disfrutar su lectura en soledad o en compañía.